You asked for it! So here it is. 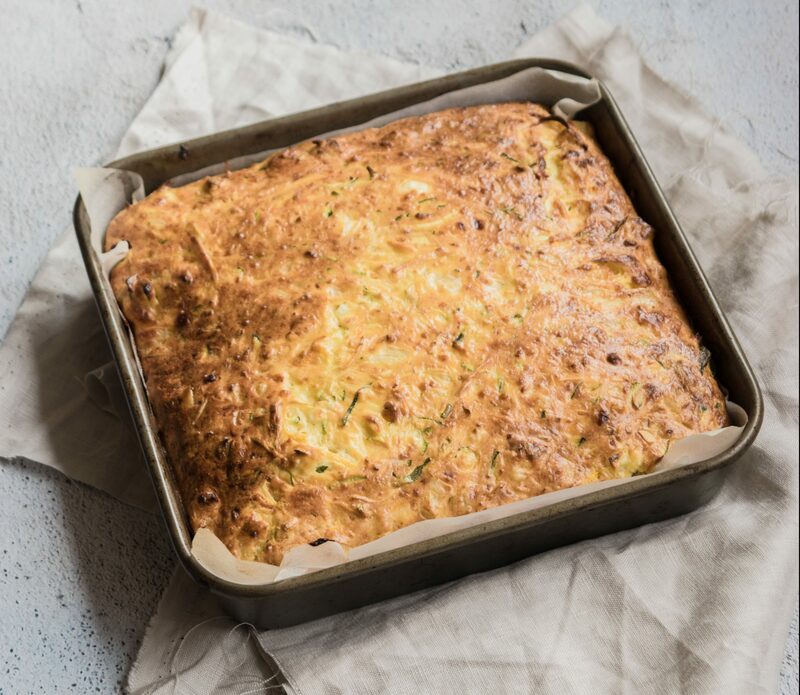 My favourite savoury snack… Zucchini Slice. I make a large one at the start of the week so my sister and I can snack on it at work. What I love about this one is it doesn’t have any bacon or ‘cheese’. Instead, I have added in cottage cheese to make it a little lighter and left out the bacon in place for more veggies – and boy does it have a lot of veggies!! 1/3 cup Rice Bran Oil, or other flavourless oil. Preheat the oven to 180C and line a square 8x8inch baking tray with baking paper. Whisk the eggs and flour together in a large bowl until smooth. Then add in zucchini, carrot, onion, salt and pepper. Fold the egg mixture over the veggies to combine. Finally, stir in the oil and cottage cheese. Then pour into the baking tray and cook in the oven for 40-50min or until golden brown and just cooked through. Allow to cool completely before slicing. Preheat the oven to 180C and line a square 8x8 inch baking tray with baking paper.Whisk the eggs and flour together in a large bowl until smooth. Then add in zucchini, carrot, onion, salt and pepper. Fold the egg mixture over the veggies to combine. Finally, stir in the oil and cottage cheese. Then pour into the baking tray and cook in the oven for 40-50min or until golden brown and just cooked through. Allow to cool completely before slicing.